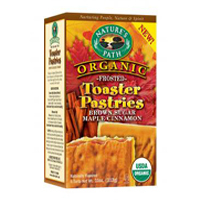 Looking for a Pop-Tart replacement, I picked up a box of these hoping they would be just as good with more nature-friendly ingredients. I was pleasantly surprised. It was a thin toaster pastry with a thin layer of hard frosting on top. The pastry part was a bit dry and crumby, especially in the parts that did not have any frosting on them, but was still pretty good. The frosting part was less sparse than I would expect from a Pop-Tart, but still had a good amount. The filling on the inside was also lacking a little bit in quantity, but made up for in flavor. As a whole, the toaster pastry had a yummy brown sugar and cinnamon flavor. I liked that it was sweet, but not too sweet, and still had a pretty good taste!